It is important that readers know that during all of my contacts with the leading personalities of the various Libyan opposition movement, in exile to publicise the establishment of The Libyan Constitutional Union and to acquaint them with it, that at no time did I ever criticise nor attack any of these individuals. Even when some directed their attacks to me personally, and spread doubts and suspicion over the reasons, goals and motives of my clear campaign. I restrained my self, from getting engaged in exchanges (verbal or written), with those who did not follow the etiquette of constructive criticism and went along a path of hostility and arrogance that drove them to consider me as their enemy which I was not. I approached them in the spirit of peace and affability for the purpose of unifying the ranks under one umbrella forming an entity that was capable of realising the aim of helping our country and saving it from the corrupt regime. Even when I was forced to take a stand against those who overstepped the boundary of professional courtesy in their personal attacks against me and my family, I always confined my responses within decency, good manners and to the point. As I have repeatedly said, my purpose of writing this article is to record and document important events and stances in our contemporary history, however, at the same time I affirm that I have been very careful to write this article and publish it when most of the people, who participated in these events, are still alive. This insures accuracy and truth in recording and documenting the information. It also requires me to give ample opportunity to those concerned to respond to the information presented in this article with respect to their referred stances and allows them to affirm, refute or add to them. In return, I hope that those people who desire to reply or comment on this article, be bound by the principles of moral responsibility in their stating of the mere facts without fabrication or distortion. I also hope that these people have the moral courage to write under their real names and not to resort to hiding behind pseudonyms making it on the one hand hard to hold them accountable for the falsehoods they propagate and on the other hand this use of pseudonyms impairs the chance for everybody to enrich serious and responsible discussions and dialogues about important events in our country’s recent history. 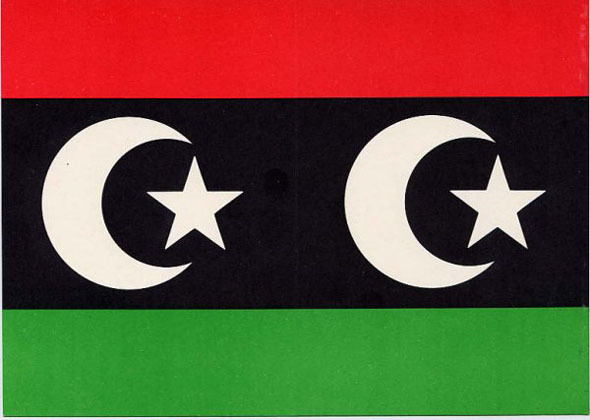 The publicity campaign for the establishment of the Libyan Constitutional Union started with a greeting card on the auspicious occasion of the Greater Bairam (Eid Aladha) as it coincided with 7th October (1981), the thirtieth anniversary of the proclamation of the Libyan Constitution. It contained the statement announcing the establishment of the L C U(1), its motives and aims. It was widely distributed among the Libyan citizens inside and outside Libya. The number of these letters reached thousands, for we managed to obtain lists of names and addresses of a large number of Libyans residing in Egypt whose numbers then could be counted in thousands. We also obtained lists of names and addresses of large numbers of Libyan students in the United Kingdom and in the United States of America (2). Furthermore, we sent thousands of letters containing the relevant information to the mail boxes in various Libyan Cities addressed to fictitious names. These would reach the owners of the mail boxes without jeopardising the safety of the mail box owners, who could easily dissociate themselves from these letters, should the oppressive authorities discover them, as those letters were addressed to unknown names unconnected to them. It came to our knowledge through some people from inside the country that the mailing of these letters had achieved the desired success to a large extent. This was on the general level, we also endeavoured to contact directly all the active Libyan opposition groups (some of their members were already known to us personally), as well as many Libyan notables to inform them about the newly established Libyan Constitutional Union through letters containing a thorough explanation of the principles and aims upon which the Libyan Constitutional Union was established. We also made personal contacts through telephone calls, mail and meetings with the personalities that we had known previously, to inform them about the matter under consideration and to explain to them fully the essential nature of the Libyan Constitutional Union and its planned aims. This was aided by issuing three carefully prepared booklets, which were sent to the relevant parties in three instalments in the period between 7 October 1981 and the end of December 1981. 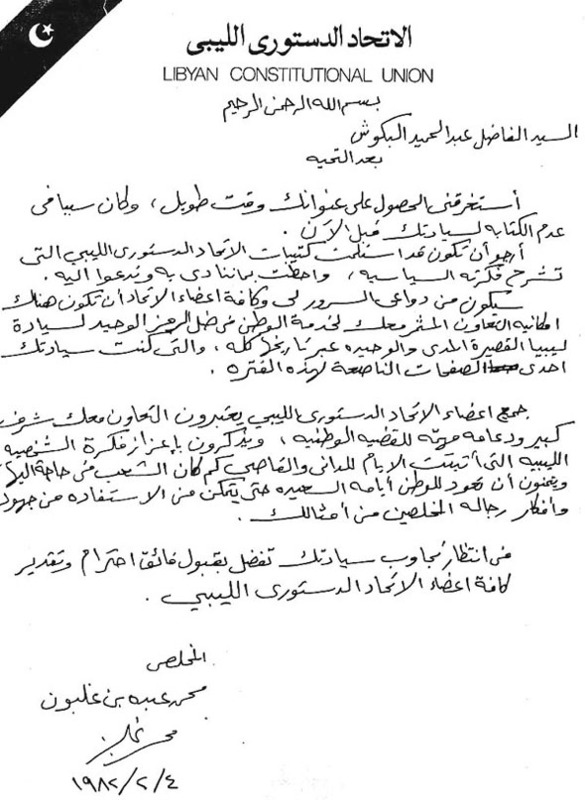 (3) In tandem with sending these letters and booklets, there was media coverage regarding the establishment of the Libyan Constitutional Union as soon as it was announced. Contrary to our expectations not many among the dozens of individuals whom we had contacted personally to inform them about the establishment of the Libyan Constitutional Union, bothered to respond or to reply. However, the reactions of those who showed a degree of interest were diverse. The replies were divided according to the level of intellect and background of the individual concerned. Some of these people who replied had a high level of moral sensitivity and a sense of patriotic responsibility, in addition to a degree of intelligence and heedfulness in grasping the concept advanced by the Libyan Constitutional Union and the ability to see its ramification on the future of the national cause. At the same time, other reactions had elements of chauvinism and the preference of personal and political interests at the expense of the national cause. Others still, were motivated and driven by tribalism without any consideration to the interests of the homeland and its essential causes. In what follows, I will talk about the various reactions which were typified by some opposition personalities in exile. These personalities were contacted and met by the Libyan Constitutional Union in the period of its establishment and after that. This was for the purpose of the unification of all the Libyan opposition under one umbrella with a program containing the assertion of the legal legitimacy which would facilitate the struggle against the ruling military regime through international legal legitimacy and accord the Libyan cause through effective means capable of toppling the corrupt regime. As I mentioned previously in part 2, my relationship with Mr. Omar El-Shelhi had grown cold and uneasy. However, our subsequent frequent meetings at the King’s residence during my regular visits to the King which I endeavoured to maintain throughout his life, had a positive effect on this relationship and softened Mr. Shelhi’s unfriendliness towards me. For, with time and as he followed the LCU’s publications, and knew me more through these visits, he became more convinced of my true intentions, and satisfied himself that I was not an adventurer who would abuse the king’s reputation or an intruder with an ill agenda. He saw that my coming close to the King was motivated by loyalty and pure love of the King, coupled with a genuine desire to benefit the national interest. With time, some sort of familiarity had formed between Omar El-Shelhi and my self, which before long developed to a strong friendship. We exchanged visits and frequent phone calls. However, this friendship did not go beyond personal amity, and never involved any sort of political alliance or co-operation. During this closeness to Mr. El-Shelhi, I discovered two distinctive marks of his character. The first was that he has a deep and unrivalled sense of patriotism towards the home land. The second and more vivid was his unlimited loyalty and devotion to King Idris. The second characteristic, which was clear to every body that had to deal with him in this regard, had turned to an overwhelming possessiveness of the King. It developed in him a level of blind jealousy that pulled him out of the realm of courtesy when he sensed that anybody was getting too close to the King or rivalling him to the King’s favour. For this particular reason, I dealt with him in this area with diplomacy and extreme tact , and made sure that I would not provoke this vulnerability. As such, there was nothing in the horizon that would muddy this relationship, until my publication in 1989 of the book “The Life and Times of King Idris of Libya”(4) which was written by Mr. Eric de Candole. That provoked Mr. El-Shelhi’s enormous outrage and from then till this day he unjustifiably took me for a bitter enemy. Details of this episode have no bearing on the subject at hand. I will, therefore refrain from expanding. What is important in this context is the fact that all that friendship and good feelings that grew between Mr. Shelhi and myself was abruptly ended by that event, and have turned to hostility that remains till this day. As I mentioned above some of the contacted opposition personalities were characterised by a certain degree of a sense of patriotic responsibility and a level of intelligence combined with heedfulness in grasping the concept advanced by the Libyan Constitutional Union and had the ability to see its ramifications on the future of Libyan cause. Mr Mohammad Othman Essaid was one of these people. I had had no previous acquaintance with Mr Essaid who was among the first who replied to the Libyan Constitutional Union contacts by a telephone call from Morocco where he is a permanent resident. In this telephone call he expressed his utmost admiration for the idea and the orientation as formulated by the Libyan Constitutional Union in the letter containing the above mentioned three booklets. He confided in me, in a state of excitement and esteem for the idea of establishing the Libyan Constitutional Union after reading its letter, that he had wished that one of his sons had come up with this enlightening idea. My friendship and knowledge of Mr Essaid grew stronger in meetings repeated with the passage of time and in which he frequently expressed his support of the orientation of the Libyan Constitutional Union and its hoped for aims. However, due to his position as a political refugee it was difficult for him to participate in any political activity in this regard. Mr Bakoosh was among the first who took care to reply to the contacts concerning the announcement of the establishment of the Libyan Constitutional Union. And his reply in this regard was not only confined to the telephone and written correspondence but also a personal meeting at my home in the city of Manchester. Mr Bakoosh made a telephone call to me in July 1982 during the holy month of Ramadan. He informed me in this phone call that he had received my letters dealing with the establishment of the Libyan Constitutional Union and that he was in London and would travel to Manchester to meet me and talk to me about the subject matter under consideration. (2) We managed to obtain a copy of lists of addresses of students studying in Britain and America which belonged to the General Union of Libyan students (UK branch). My brother, Hisham, was one of its founder members. 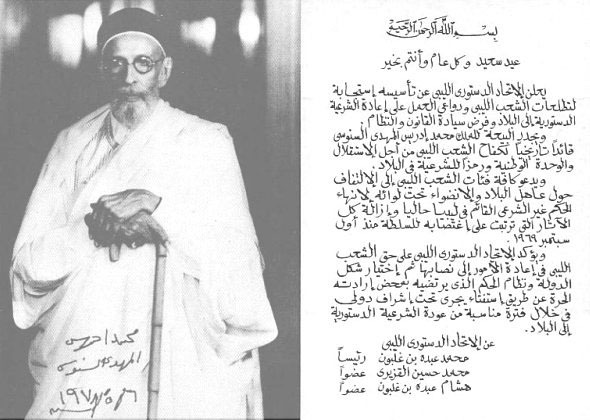 (4) “The Life and Times of King Idris of Libya”, first published by the author Mr. E.A.V. de Candole in a private edition of 250 copies in 1988 as a tribute to his friend King Idris I. The author was forced to publish it privately in this small number after his attempts to get a publisher for this book have failed. Having secured permission from the author, I passed it to my friend Mr. Mohamed El-Gazieri who translated it to Arabic. I then published it in 1989 and distributed it free of charge to friends, researchers and those who have an interest in Libya. I also provided complimentary copies to numerous public libraries and University libraries in the Arab and Islamic world, as well as Europe and the USA. The purpose of this action was to honour Libya’s great late King Idris El-Senussi by providing researchers world wide with a credible account of his life compiled by a credible and close contemporary to the late king. The book contained important details, which we felt should become a source of information for writers and historians. In May 1990 I republished it both in Arabic and English and distributed it freely on a wider scale in the same manner. The costs of publication and distribution of the second edition were shared equally with me by two Libyan patriots who asked for their identities not to be revealed for fear of persecution from the Libyan despotic regime. The Libyan Constitutional Union hereby proclaims its institution in deference to the aspirations of the Libyan people and the exigencies of seeking to restore constitutional legitimacy to the nation and to re-establish the rule of law and order. The Union reiterates the pledge of allegience to King Muhammad Idris al-Mahdi Sanusi as historical leader of the Libyan people's struggle for independence and national unity and as a symbol of legality for the nation. It calls upon all Libyans to rally around their monarch and under his banner to put an end to the illegitimate regime now existing in Libya and to eliminate all the consequences that have accrued from its usurpation of power since September 1st 1969. The Libyan Constitutional Union emphasizes the right of the Libyan people to restore justice and thereafter to decide such form of body politic and system of government as they may choose of their own free will in a referendum to be conducted under international supervision within a reasonable period from the restoration of constitutional legality to the nation. It has taken me a long time to obtain your address and that is the reason of not writing to you until now. I hope that you have received the Libyan Constitutional Union Booklets which explain its political idea and what we strive to achieve and stand for. I and all members of the Libyan Constitutional Union would be pleased if there is a possibility of fruitful cooperation with you to serve the homeland in the shadow of the only symbol of the Libyan sovereignty which was short in duration and unique in the entire history of Libya. Furthermore, you were one of the brilliant pages of this period. All the members of the Libyan Constitutional Union consider co-operating with you a great honour and an important consolidation of the national cause and they remember with pride and appreciation your idea of the "Libyan Personality" which time has proven how much the people were in need of and they wish for the return to the homeland its happy days so that it can make use of the efforts and ideas of the sincere people like you.